Some genetic genealogists and genealogists pan genetic ancestry or ethnicity admixture estimates. They see them as not useful and wouldn't mind if ethnicity predicting was discontinued. On the other hand, I see genetic ancestry estimates as part of the genealogy cycle of life. I understand that matching to genetic relatives is a natural progression from traditional genealogy methodology and practices, but genetic ancestry estimates are a natural extension of DNA relative matching and both can be used synergistically to achieve optimal results. 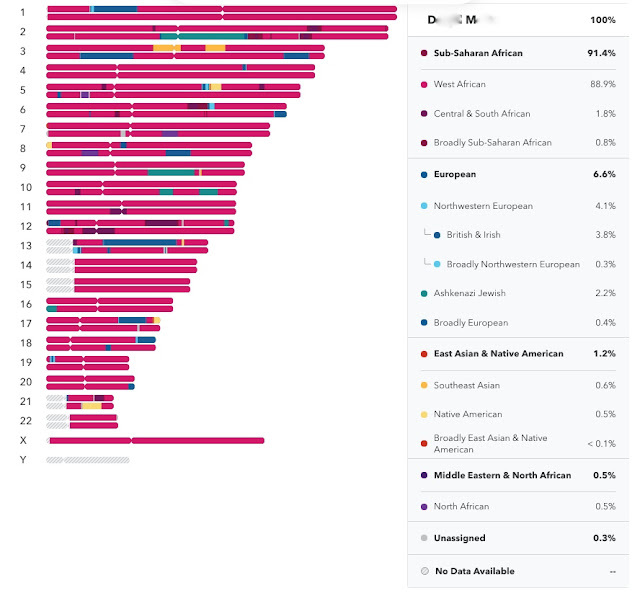 I'm sure by now you've seen or heard about 23andMe's new Recent Ancestor Locations feature added to its Ancestry Composition tool or last year's AncestryDNA Genetic Communities included with its Ethnicity Estimates—each touts unprecedented granularity with genetic ancestry estimates and addition of over 100 regions or reference populations. 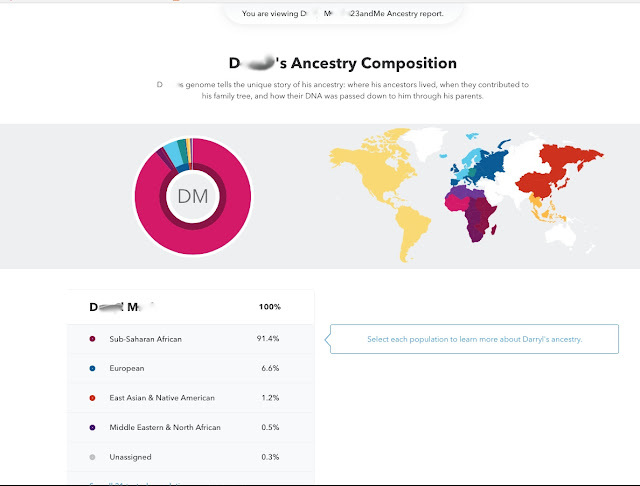 Thus 23andMe ($99 US; $199 w/Health) and AncestryDNA ($99 US) have figured out a way to make their ethnicity admixture tools more relevant by "marrying" genetic ancestry to our genetic relatives! Both DNA testing market leaders have been able to achieve this matrimony by "fine-scaling" their respective ethnicity admixture offerings, which I will review for this blog. PINK ELEPHANT IN THE ROOM: On May 11, 2018, 23andMe hit AncestryDNA with a patent infringement and false advertising lawsuit [see here]. Based upon the bones of the case my analysis may seem to implicate a party. However it's unintentional as I've been working on this blog prior to the lawsuit. I hope the legal issue is amicably resolved between the parties. This blog is in honor of my cousin Clara Harvey, who turned 95 on April 26, 2018, just one day after National DNA Day. She is truly one of the last Mohicans — one of two surviving first cousins from my maternal grandfather's generation. 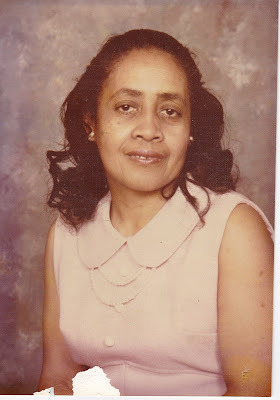 With Mother's Day fast approaching, this is the perfect time to share phenomenal news about matriarch Clara's MATERNAL (mitochondrial-DNA or mtDNA) HAPLOGROUP, and we took it to the "Bank" (more on this later). I'm also making an urgent appeal to add Cousin Clara's maternal haplogroup to the mtDNA phylogenetic tree so we can present it to her at an upcoming family event. I also have a new hypothesis about the source of our Native American ancestry. In my recent blog Guide to Building Your Family's Haplotree I revealed that cousin Clara's Maternal Haplogroup was B2, which is exclusively found in Native Americans. Since cousin Clara's mother and my grandfather's mother were full sisters this proved that the direct matrilineal line of my maternal grandfather — and by extension myself — biologically descend from a foremother of Native American descent. I pray this blog inspires more relatives from my maternal grandfather's branch (Gillette, Hall, Jackson, Shipley, Van Horn, Van Ness, Winkey, Wyckoff) to participate in DNA testing; see my Family History & Genetic Genealogy Book Project. Our cousin Cousin Clara (and her brothers) tested without hesitation and in return unlocked a rich legacy that keeps exceeding all expectations. 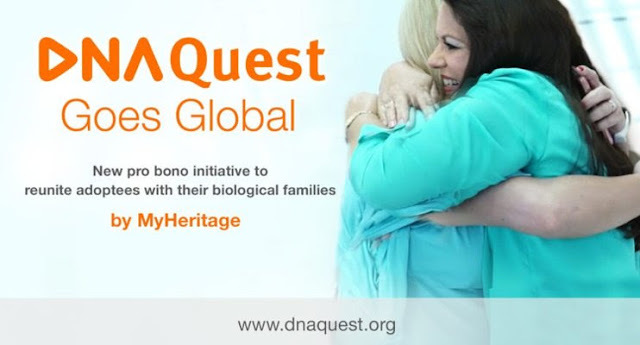 In March 2018, MyHeritage launched DNA Quest,"a new pro bono initiative to help adoptees and their birth families reunite through genetic testing." DNA Quest, first available in the United States, received such an outstanding response that the program is now being expanded globally! The initiative, initially launched in the USA only, received an amazing response. More than 10,000 applications were submitted so far to receive free DNA kits, from the quota of 15,000 free DNA kits pledged by MyHeritage, worth more than one million dollars. Being that the deadline for submissions is the end of April 2018 and there are still about 3 more weeks to go, and in light of the many requests we received from the community to expand DNA Quest worldwide, we decided to increase the scope of the project, from USA-only to global. This means that people are now eligible to participate in DNA Quest regardless of their place of residence and regardless of where the adoption took place. Remember the deadline to participate in MyHeritage DNA Quest is April 30, 2018. So if you're interested in this important initiative please visit www.dnaquest.org NOW to enroll. King Genome's Tip: If you've already tested at another DNA company, you can upload your DNA data to MyHeritage for FREE. I wish you all abundant success and great luck with your search! The instantly iconic Marvel Comics film Black Panther (2018) sparked an epic socio-cultural movement by the masses to take pride in their African roots, to don haute tribal couture, and even hold voter registration drives at movie theaters. 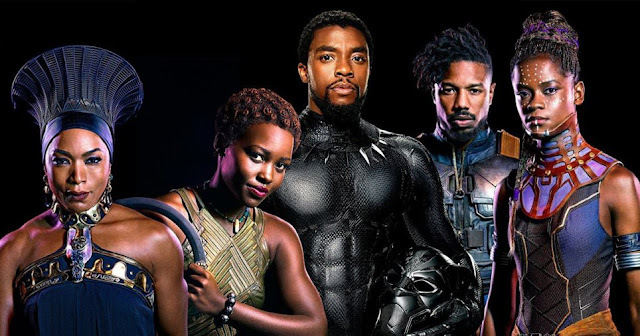 Featuring a mostly Black cast and a young African-American director, Ryan Coogler, the nascent epic triggered one of those Malcolm Gladwell tipping points—an uplifting of our collective self-image; a renewed conversation sparked between African-Americans and continental Africans about their connection, and a vibrant curiosity in people lusting to find their specific African roots. 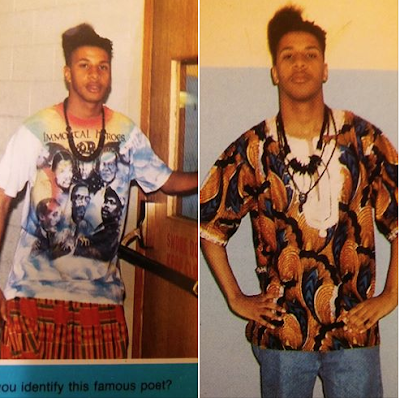 It harkened me back to my adolescence when I was known as "The Great Black One" and became the first student at my famous high school ("Lean On Me") to found an African-American club. My conscience allowed me to exude the same African pride I'm seeing today. Of course my T'Challa then was Kunte Kinte, the Mandinka warrior from the village of Juffra in present-day Gambia. I knew it would be nearly impossible to find a paper trail like that of Alex Haley's "factional" Roots because the proof was invisible, scarce and scant...we didn't even have the internet. Yet I've always carried within me an innate desire to know more about the beauty, culture, identity, and power that was raped from us. Can I now find my pot of Kwandan vibranium, or was it forever plundered like Akan gold? It wasn't until 2012 as genetic genealogist "King Genome" that I discovered I can use DNA testing to find the specific tribal origins of my enslaved African ancestors. In this blog I'm going to discuss (1) how to identify your genetic African relatives; (2) you'll "meet" four of my African cousins, and (3) I'll tell you about a fascinating African named Ari Van Guinea, who became the richest Black man in New Jersey 50 years before the US Revolutionary War. Wakanda, Africa, is not a real place. Academic Jelani Cobb wrote in his New Yorker magazine review: "Africa—or, rather, “Africa”—is a creation of a white world and the literary, academic, cinematic, and political mechanisms that it used to give mythology the credibility of truth. No such nation as Wakanda exists on the map of the continent, but that is entirely beside the point." For the majority of African descendants in the Americas our "Africa" might as well be in Wakanda because our actual ethnic origins felt like a sort of mythical—and stereotypical—place often shaped by what we saw on TV, absorbed in schools, read in books or ingrained in our psyche by a society still shackled by the psychological chains of chattel slavery. A desert. A disease. A famine. A jungle. A place with primitive people who lived somewhere in the Motherland. I certainly didn't learn about real-life kingdoms like Manden Kurufaba (Mali Empire), or the fierce Dahomey Amazons of Benin, or the fact that Ethiopia has never been colonized by Europeans. Or that Africa has lush and luxe beauty. Black Panther director Coogler as co-writer was brilliant to draw on these factual gems to create a desirable place to claim like Wakanda. I was raised around African immigrant communities in the New York City area, and exposed to great Africana intellectuals (Drs. John Henrik Clarke, Wendell Holbrook, Said Samatar, Yosef Ben-Johchannan, Amiri Baraka, Clement A. Price) during my college years at Rutgers University. But in my home ghetto there was no common fellowshipping between Africans and African-Americans about our blood connection to the Trans-Atlantic slave trade. The concept seemed to be as foreign to them as their (and our) ancestral homeland was to us. On February 8, 2018, DTC personal genome service 23andMe announced a new Global Genetics Project. 23andMe's goal with the new Global Genetics Project is over the next two years to test over 5000 people whose recent ancestry is from Africa, the Americas, Asia and Oceania covering over 61 qualifying countries. * It's FREE and totally worth sharing with all of your friends. 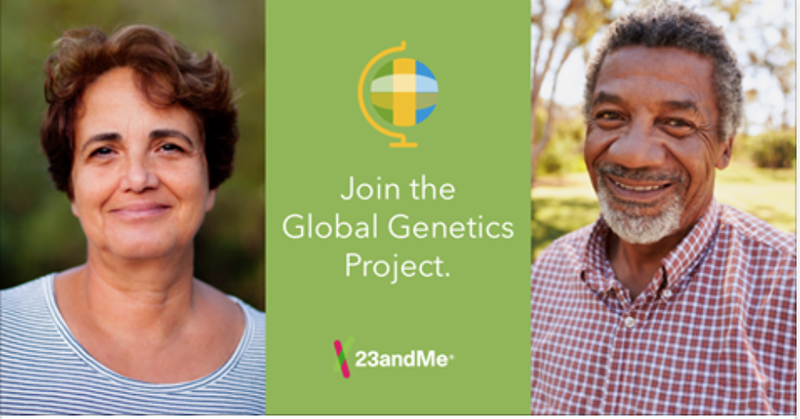 According to 23andMe, "This work will help 23andMe expand its reference data sets, improve the ability of our scientists to study groups who are currently underrepresented in genetic research and reveal new insights into patterns of human migration and genetic diversity." Read 23andMe's blog release here. 23andMe's Global Genetics Project takes off after the success of its 2016 African Genetics Project, which recruited people whose grandparents were born in certain West African countries connected to the Trans-Atlantic Slave Trade. To this extent, 23andMe has been at the forefront of improving genetic diversity in genetics with such past initiatives as the Roots Into The Future Project and African American Sequencing Project. Of course 23andMe's Global Genetics Project has rules (see Qualifications below), and one them is you must reside in the United States. Now some of you may wonder why 23andMe did not open the project to people who actually live in the qualifying countries,* but I suspect it is due to federal regulations, grant restrictions and avoidance of foreign government bureaucracy because health testing is involved. KING GENOME'S TIP: If you've tested previously at 23andMe and you meet the qualifications then you can still join the Global Genetics Project for FREE (but you won't receive any health results). This is a great opportunity to retest on 23andMe's powerful new v5 chip (see my blog here). ENROLL NOW IN THE Global Genetics Project. Back on August 8, 2017, DTC personal genome service 23andMe quietly announced that it was upgrading its genotyping chip for a fifth time to the Illumina Infinium Global Screening Array-24 v1.0 Bead Chip (GSA) — aka 23andMe version 5 or v5 — and promised new customers more improved ethnicity reports, especially those with non-European ancestry, and those with African ancestry would be the first to receive more specific African ancestry updates. I'm excited already. 23andMe's latest chip upgrade comes on heels of the US Food & Drug Administration relaxing its restrictions on health testing for DTC personal genome companies. However it's unclear if customers on 23andMe's prior chips versions will be upgraded — and it may cost you. 23andMe also has been notoriously slow with past major upgrades — the transition to 23andMe's revamped site took more than 2 years — so I jumped at the chance to test a third time (actually 4th) to be on the new promising v5 chip. Since I've 23andMe results from the two prior chip versions (v3 and v4), I can compare all three to determine if v5 lives up to the hype. You can read about all the bells and whistles of the GSA chip at genetic genealogist Debbie Cruwys Kennett's excellent blog here. My comparative analysis will focus mostly on ancestry features for 23andMe's last three chip versions (v3, v4, v5). At close of this deep dive I will reveal my new 23andMe v5 Ancestry Composition results and tell you whether it's worth testing NOW to be on the v5 chip. And if you're a current customer on an older chip version, I'll tell you if you should take a chance waiting on a future fee-based upgrade. 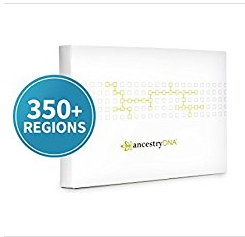 There are about 15 million known SNPs (aka Ancestry Informative Markers) for genetic ancestry but only 1-to-5 million are utilized by advanced genetic studies, and much less (~700,000) by vendors like DTC DNA testing companies (ie 23andMe). 23andMe FINALLY restored our ability to see the chromosome paintings and ancestry report of the people we are sharing with in your DNA Relatives list. This was another quiet and soft roll-out or restoration by the DTC personal genome service, and only appears to affect some US customer accounts for now. I've been campaigning a long time for 23andMe to restore this feature and raised the issue in several forums and blogs. Our ability to see our DNA relative's chromosome paintings was absconded when 23andMe decided to upgrade its interface and Web site (aka the New Experience) a couple of years ago. It was replaced with an "Ancestries in common" tool but without a chromosome painting. As a result the "Ancestries in common" tool wasn't very useful: the feature shows ALL of the ethnicity assignments shared between you and another person but you may not genetically share most of those ethnicity assignments through a common ancestor or ancestral couple. There are some caveats. If you're on chip version 3 (v3) or earlier, your DNA Relatives includes anyone you invited to share with you (whether related or not) but the new feature is missing. You will have to access it from "Your Connections" option on your Tools drop-down menu. Or you can invite your relatives and friends using the Share & Compare tool. For v4 and v5 customers, you can only see the ancestry compositions and chromosome paintings of the DNA relatives and friends who accepts your request to share ancestry or ancestry+health reports. Even if your DNA Relative is "Open Sharing" with you, a sharing request must be sent. 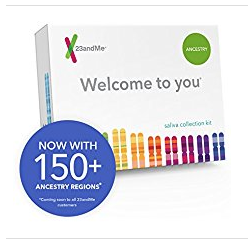 So if you're a 23andMe customer, you will be extremely happy at the return of our ability to see the ancestry reports and chromosome paintings of the people we're sharing with. We will able to better trace and see the ethnicity of the segments we share with those relatives, which I discuss at length in my Ethnicity Chromosome Mapping blog here. King Genome's Wisdom: Don't forget to "Request to share" (as shown below) with your DNA Relatives even if you are Open Sharing with them; the "Sharing" option is located at bottom of the page when you click on any of your DNA relatives. You can also invite Friends by going to the "Share & Compare" feature and inviting them by their 23andMe log-in e-mail.